Take That are taking their seats alongside James Corden in a Comic Relief edition of his phenomenally success carpool karaoke sketch. Gary calls shot gun while Howard and Mark take the back seats in an effort to raise money for the charity next weekend. The segment will be broadcast during the main comic relief show on March 24, and coincides with the release of Take That’s eighth studio album Wonderland. 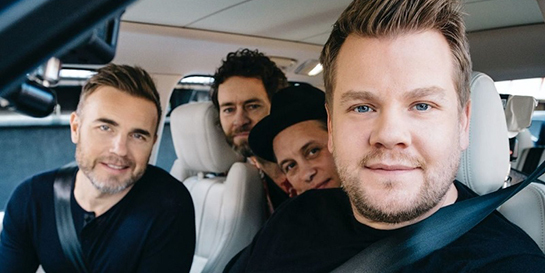 The crew were spotted filming the sketch in Los Angeles earlier this year, but Take That and James Corden only confirmed their partnership for Red Nose Day this week by posting a widely-shared image of the quartet gathered in the car. The gang also appeared on the cover of this week’s Radio Times alongside an exclusive interview. The pop icons have been working on their new record with renowned producers Tony Hoffer (Beck, Supergrass, Goldfrapp), Stuart Price (Madonna, The Killers, Gwen Stefani) and Mike Crossey (Arctic Monkeys, The Gaslight Anthem). Fans will see the trio perform new material from the album live for the first time when they embark on their UK tour in May. With six dates at the O2 Arena, the Wonderland show will be the biggest arena tour of the year. The video for lead single Giants was premiered on Good Morning Britain on Wednesday and kicked off the TV campaign which, in addition to the Comic Relief segment, includes an hour long ITV special. Take That are one of the UK’s most successful acts with a career spanning over three decades which has seen them achieve seven number one albums, 54 international number one hits and take home over 20 awards including eight BRITs and five Ivor Novello awards.